The new Pabobo Super Nomade light is a clever little night light. There's no plug, no batteries - just a handy little USB charger and the best bit of all? It can last for up to a month from one single charge! We've been testing it for nearly two weeks now and we've loved it. 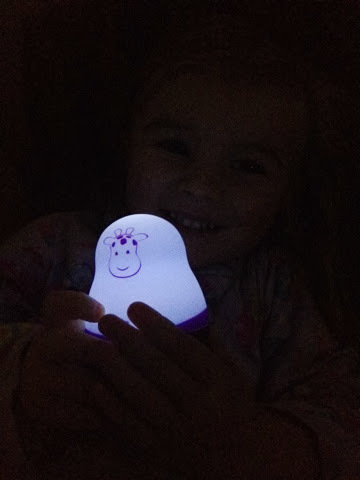 Little E has a slight phobia of the dark so bedtimes can be difficult but this has had a great effect on bedtimes... she absolutely loves it! We leave it on her bedside table but by the time we head up to bed she's always fast asleep with it in her hand. No need to worry though - the cold LED system means that the night light will never heat up - even under the covers - so it's completely safe. If you're wondering how the charge lasts so long - the Pabobo Super Nomade has a special built in sensor so it can tell when it is light and dark, so it turns on and off by itself. And if you need a bit of extra light to check on your little one in the night then theres a little button on the back that doubles the light intensity too! We think it's absolutely amazing and the great thing is it small enough to take with us when we're on our travels. It would have been great when we were camping in the Summer and will be definitely part of essential camping kit come Spring. It's beautifully designed and comes in three cute designs. I can not rate this highly enough! !